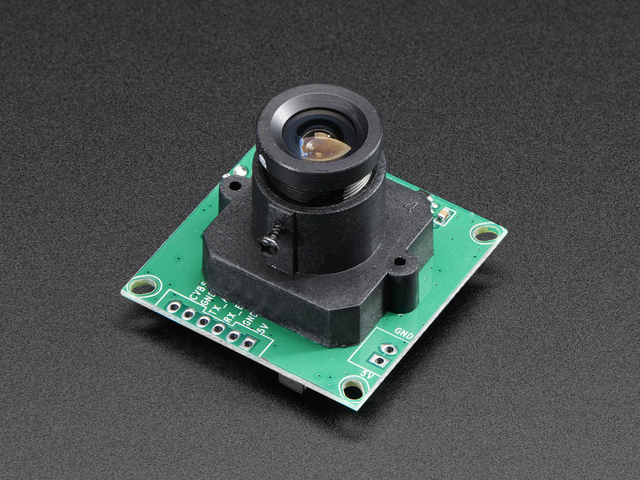 This tutorial is for our new TTL serial camera module with NTSC video output. These modules are a nice addition to a microcontroller project when you want to take a photo or control a video stream. The modules have a few features built in, such as the ability to change the brightness/saturation/hue of images, auto-contrast and auto-brightness adjustment, and motion detection. Since it is a little confusing how this is both a snapshot and video camera, we'd like to explain it in detail now. The module was initially designed for surveillance purposes. Its meant to constantly stream TV-resolution video out of the Video pin (this is NTSC monochrome format) and also take commands from the serial port. The serial port commands can request that the module freeze the video and then download a JPEG color image. So for example, normally its just displaying video to a security monitor. When motion is detected, it would take a photo and save it to a disk for later analysis. The module is admittedly not extremely high resolution - the maximum image size it can take is 640x480 pixels. And it is sensitive to infrared light, which alters the color rendition somewhat. The reason for all this is that it's meant for surveillance, not for nature photography. However, as far as we can tell, this is the best module on the market. Here are two example images, one of outside during a cloudy day, and one inside on a sunny day. The module comes without any connector so you'll need to solder wires into the connection pads. The good news is the pads are not too close togehter (about 2mm) and you can use any stranded or solid-core wire. If you'd like to get NTSC video out to connect to a TV or monitor, solder another black wire to the second Ground pin, and a yellow wire to the CVBS pin. The quickest way to test out the modules is to use the NTSC video out connection. That way, when you adjust the view & focus you can immediately see the results. Paired with the next section (using the Comm Tool), its the ideal method of introducing yourself to the module. Most TV's and monitors require an RCA jack or plug input. We just soldered a spare RCA jack to the camera, with black being the case ground and yellow signal. You can get RCA cables and accessories in any hobby/electronics shop like Radio Shack. Plug in the NTSC cable to your monitor, and connect the red and black power wires to +5V supply - you should get monochrome video output on the monitor immediately! Note: 'Hijacking' the serial port only works on Arduinos with a separate USB interface, like the Uno. It won't work on a Leonardo! If you're using a Leonardo, Micro, Yun, or other ATmega32U4-based controller, use this Leo_passthru sketch instead of the "blank" sketch. // fingerprint reader and Windows. Start up the software and select the COM port that the Arduino is on. The next button you should press is near the bottom FBUF CTRL. This is quite a panel, but we can use this to get images directly from the camera which is good for debugging. Thats it! You can now easily test reading camera images. To take another photo. Press Resume up at the top to have the video start up again. Then click Stop CFbuf when you want to snap another photo. Finally you can select the Compression Ratio which will improve or degrade the image quality but also change the image transfer time. There's no way to change the image size from this program (easily) but we can do it using the Arduino sketch so just try it out here to start. You might notice there's a dropdown for changing the baud rate. By default the baudrate is 38400 baud. Despite the software letting you change the baud rate this is a very flaky setting and even if it works, when you power up the camera again it will reset. Some experimenters have accidentally disabled their cameras by trying to change the baud rate. We do not suggest you mess with the baud rate settings. If you do, you may permanently disable your camera and we will not replace it! There are many options for this software, here's what we think of the other buttons. Personally, we don't suggest going in to any of them unless you really need to. Power Ctrl - this is for testing the power down mode, and it seems like you might be able to have it auto-power down when there's no motion. Motion Ctrl - this is for the motion detection system. You can tweak the settings and also test it. We have an Arduino sketch for interacting with the motion detection system. By default it works pretty good but you can super tweak it out if you want to. Other Ctrl - for playing with the DAC? No idea what this is for. Next up, we will wire the camera to our microcontroller (in this case an Arduino). This is pretty similar to the above except we will be using two digital pins and a software serial port to talk to the camera. To save images, you'll need some sort of external storage like our microSD breakout board. We suggest testing the microSD card first. Check out our microSD breakout board tutorial and verify that you can read from the card by listing the files. Once you have verified the microSD card wiring, you can come back here and install the VC0706 camera library. Visit the Github repository here. To download. click the DOWNLOADS button in the top right corner, rename the uncompressed folder Adafruit_VC0706. Check that the Adafruit_VC0706 folder contains Adafruit_VC0706.cpp and Adafruit_VC0706.h Place the Adafruit_VC0706 library folder your arduinosketchfolder/libraries/ folder. You may need to create the libraries subfolder if its your first library. Restart the IDE. // Remember that bigger pictures take longer to transmit! A neat thing that the camera has built in is motion detection. It will look for motion in the video stream and alert the microcontroller (by sending a serial data packet) when motion is detected. IN this way you can save a bit of cash and skip on having a PIR sensor (although a PIR sensor will be better at detecting warm mammalian things). Load up the File-> Examples-> Adafruit_VC0706-> MotionDetect sketch and upload it to the Arduino. It will take a photo immediately because it just turned on. Then wait a few minutes and wave you hand in front of the camera, it will take another photo. //  Motion detection system can alert you when the camera 'sees' motion! You'll need to 'poll' the camera to ask it when motion is detected, by calling motionDetected()- it will return true if motion was recently detected, and false otherwise. In addition to taking pictures with the camera in Arduino you can also use a CircuitPython module to snap photos and save them to a SD card! 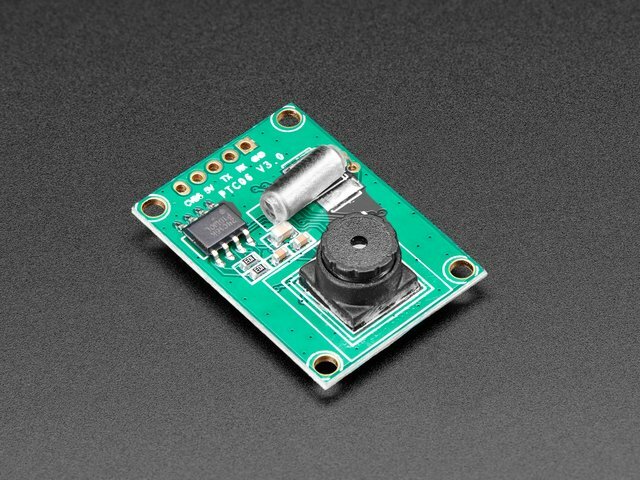 The Adafruit CircuitPython VC0706 module is your key to accessing the TTL camera and grabbing images over its serial connection. Camera 5V to board USB or 5V power (note this means you must have the board plugged in to a USB / 5V power supply to properly power the camera). Camera GND to board GND. Camera RX to board TX. Camera TX to board RX. In addition make sure a micro SD card formatted with the FAT32 filesystem (highly recommended to use the official SD card formatter here and not your operating system's formatter!) inserted in the SD card holder. 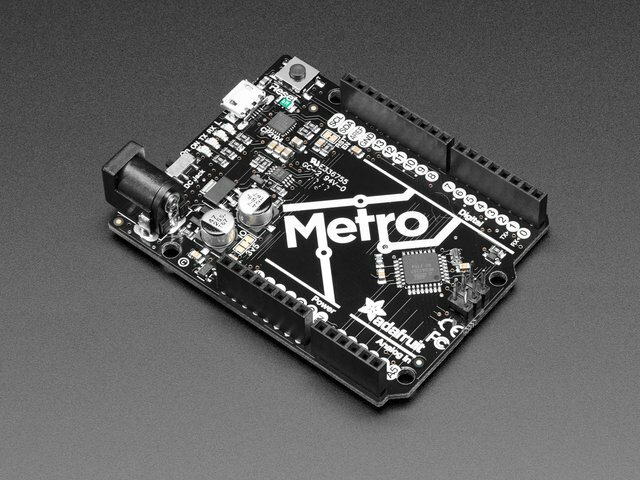 As mentioned you'll also need to install the Adafruit CircuitPython VC0706 library on your CircuitPython board. In addition the Adafruit CircuitPython SD library is used to read and write data to the SD card. Remember both modules are for Adafruit CircuitPython firmware and not MicroPython.org firmware! Or download the file from the latest release on the Adafruit CircuitPython VC0706 releases page. Before continuing make sure your board's lib folder or root filesystem has the adafruit_vc0706.mpy, adafruit_sd.mpy, and adafruit_bus_device files and folders copied over. # VC0706 image capture to SD card demo. # card holder pre-wired to the board--this sketch is setup to use the Adalogger! IMAGE_FILE = '/sd/image.jpg'  # Full path to file name to save captured image. # Setup SPI bus (hardware SPI). # Setup SD card and mount it in the filesystem. # Create a serial connection for the VC0706 connection, speed is auto-detected. # Print the version string from the camera. # Set the image size. # Print size of picture in bytes. # Open a file for writing (overwriting it if necessary). # This will write 50 bytes at a time using a small buffer. # You MUST keep the buffer size under 100! # a multiple of 4 and under 100. Stick with 32! # Read picture data into the copy buffer. # Write the data to SD card file and decrement remaining bytes. # Print a dot every 2k bytes to show progress. Be aware saving the image to the card takes some time as the data is transferred over both a serial connection from the camera and the SPI connection to the micro SD card. A full image capture at 640x480 pixels takes about 30 seconds, but might take longer depending on your board and micro SD card speed. Woo hoo, that's all there is to the basics of capturing an image with the serial TTL camera and CircuitPython! Let's look at the code in a tiny bit more detail to understand the usage. Now the VC0706 module is setup and an instance of the VC0706 class is created. Notice we need to create a UART device on whatever pins have hardware support and then this is passed to the camera creator. Now the real fun, you can capture an image! This works by first telling the camera to 'freeze' the current image frame in memory with the take_picture function. Then you need to make a loop that calls the read_picture_into function repeatedly to grab buffers of image data from the camera. Once you have image data it's up to you to do something with it, like write it to a SD card file (although you don't have to do that, you could send it to a web service or do other fun thing!). One thing to be aware of is that the size of the buffer passed to read_picture_into must be a multiple of 4--this is an requirement of the camera hardware itself. In addition it must be below 100 to fit within an internal buffer. Stick with using a value of 32 like the example here shows! That's all there is to capturing and saving an image! Instead of using the SD card to store images it's also possible with CircuitPython 2.0+ to save images to the internal filesystem where your code and other data files live. This is possible with a few caveats, in particular once you enable writing to the internal storage you can't set or change your code over the USB drive connection to your computer. This means you probably want to get your program working first on SD storage or ignoring the file save, and then switch to using internal storage when you know your code is working and ready to write files. # you can edit files over the USB drive again. Remember once you remount("/") you cannot edit code over the USB drive anymore! That means you can't edit boot.py which is a bit of a conundrum. So we configure the boot.py to selectively mount the internal filesystem as writable based on a switch or even just alligator clip connected to ground. Like the CPU temperature guide shows . In this example we're using D5 but select any available pin. 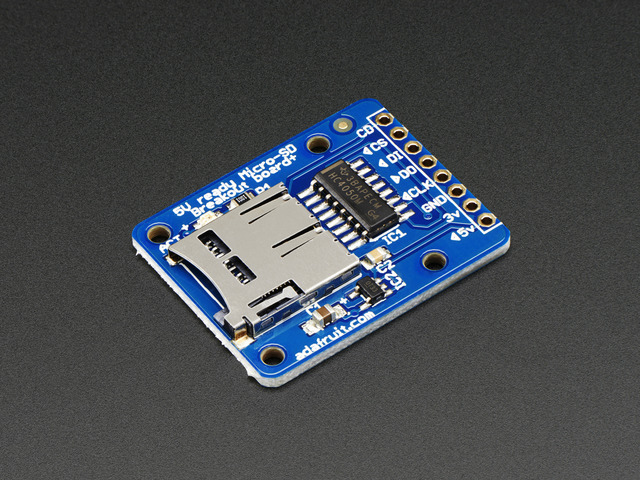 This code will look at the D5 digital input when the board starts up and if it's connected to ground (use an alligator clip or wire, for example, to connect from D5 to board ground) it will disable internal filesystem writes and allow you to edit code over the USB drive as normal. Remove the alligator clip, reset the board, and the boot.py will switch to mounting the internal filesystem as writable so you can log images to it again (but not write any code!). Remember when you enable USB drive writes (by connecting D5 to ground at startup) you cannot write files to the internal filesystem and any code in your main.py that attempts to do so (like the example below) will fail. Keep this in mind as you edit code--once you modify code you need to remove the alligator clip, reset the board to re-enable internal filesystem writes, and then watch the output of your program. If you ever get stuck, you can follow the steps mentioned in https://learn.adafruit.com/cpu-temperature-logging-with-circuit-python/writing-to-the-filesystem to remove boot.py from the REPL if you need to go back and edit code! Now we can use a slightly modified version of the example that will save to the internal filesystem instead of a SD card. 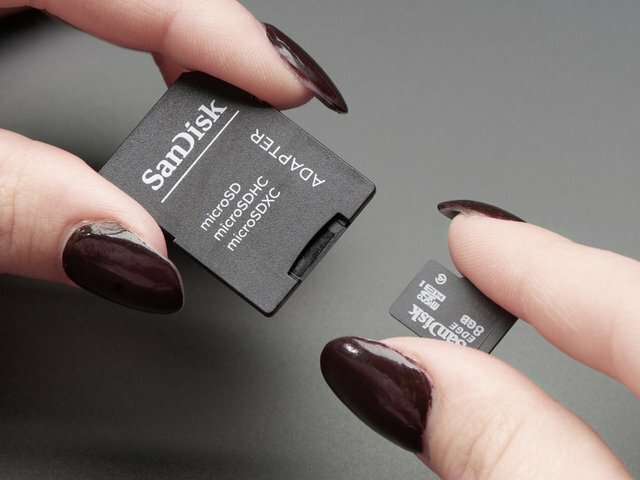 The code is exactly the same as for SD cards except instead of mounting the SD card and opening a file there, we open a file on the internal storage. The exact same VC0706 functions and control loop are used because Python's read and write functions don't care if they're writing to a SD card or internal storage--it's all the same to Python! # VC0706 image capture to internal storage demo. IMAGE_FILE = '/image.jpg' # Full path to file name to save captured image. Can I change the baud rate on this Camera? You might notice there seems to be a command for changing the baud rate. By default the baudrate is 38400 baud. How fast can I get pictures from the camera? Why is the color washed out? It looks like a monochrome image. Because it was designed for surveillance, the sensitivity of the camera extends into the infrared range. This means that objects that reflect or emit infrared rays will appear lighter than the do to the human eye. In some cases the image will appear washed out and almost monochromatic. 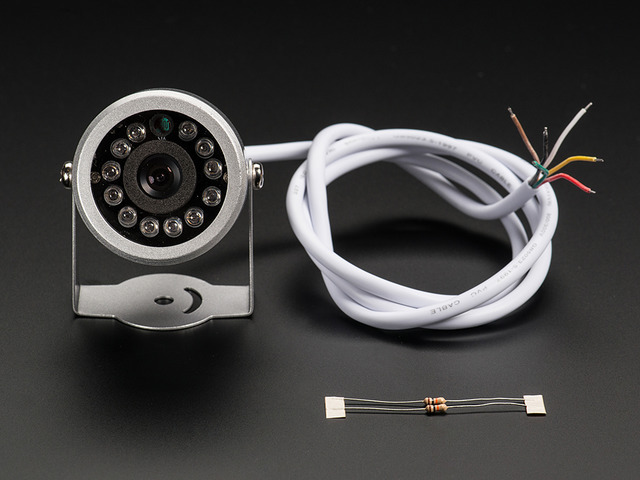 https://github.com/oskarirauta/Adafruit-VC0706-Serial-Camera-Library is a version for the Maple - we didn't write this code and don't support it but it might be handy for Maple users!